In 1971 the US muscle car wars had peaked. The result of this was an outstandingly powerful and equally beautiful automobile, the HEMI 'Cuda convertible. This rare beast is one of only 11 ever produced. Commonly thought of as the most desirable muscle car in the world, it is exceedingly unusual to see one of these for sale. This particular offering boasts of highly desirable features. These features include the 426 HEMI V8 engine with two four barrel carburetors, 727 automatic transmission, Super Track Pak package with DANA 60 rear end and 4.11 ratio gears, power convertible top, center console and more. This vehicle was built for Canadian export of which only two were built. 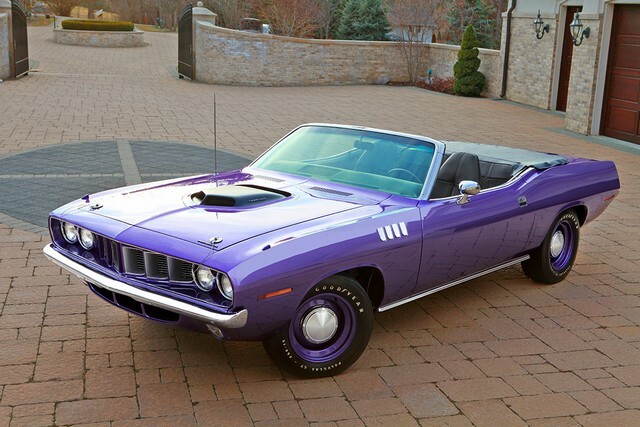 In addition, it is finished in its factory correct In Violet (Plum Crazy) paint, making it the only 1971 HEMI 'Cuda Convertible in this color. Following a meticulous restoration to the highest museum standards, it has been inspected and appraised by Mopar guru Galen Govier. A true automotive milestone and extraordinary example of Detroit Muscle at its finest. Has original dealer invoice. Return of the Stingray - The 2014 Chevrolet Corvette. 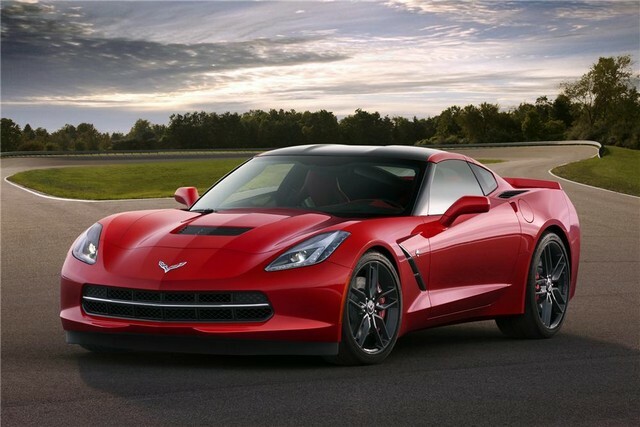 This all new Corvette Stingray is the perfect balance of technology, design and performance. The lucky winning bidder for this 2014 Corvette Stingray will receive the first retail production vehicle of this seventh-generation Corvette - a Vin ending in #0001. The 2014 Corvette Stingray is the most powerful standard model ever, with an estimated 450hp (334 kW) and 450ft/lbs of torque (610 Nm). It is also the most capable standard model ever, able to accelerate from 0-60 in less than four seconds and achieve more than 1g in cornering grip. It is expected to be the most fuel efficient Corvette, exceeding EPA-estimated 26 mpg of the current model. The all new Corvette Stingray incorporates an all-new frame structure chassis, a new powertrain and supporting technologies, as well as completely new exterior and interior designs. Highlights include: An interior featuring real carbon fiber, aluminum and hand-wrapped leather materials, two new seat choices - each featuring a lightweight magnesium frame for exceptional support - and dual eight-inch configurable driver/infotainment screens. Advanced driver technologies, including a 5-position Drive Mode Selector that tailors 12 vehicle attributes to the fit the driver's environment and a new 7-speed manual transmission with Active Rev Matching that anticipates gear selections and matches engine speed for perfect shifts every time. An all-new 6.2 Liter LT1 V8 engine combines advanced technologies, including direct injection, Active Fuel Management, continuously variable valve timing and an advanced combustion system that delivers more power while using less fuel. Lightweight materials, including a carbon fiber hood and removable roof panel, composite fenders, doors and rear quarter panels, carbon-nano composite underbody panels and a new aluminum frame help shift weight rearward for an optimal 50/50 weight balance that supports a world-class power-to-weight ratio. A sculptured exterior features advanced high-intensity discharge and light-emitting diode lighting and racing-proven aerodynamics that balance low drag for efficiency and performance elements for improved stability and track capability. An available track-capable Z51 Performance Package including: an electronic limited-slip differential, dry-sump oiling system, integral brake, differential and transmission cooling, as well as a unique aero package that further improves high-speed stability. This 1968 L-88 Corvette sponsored by Owens/Corning Fiberglass holds the title as the most victorious Corvette in history. Campaigned by Tony DeLorenzo, Jerry Thompson, Don Yenko and Gib Hufstaeder, this car was nearly unstoppable in FIA GT and SCCA National racing. Some accomplishments include the 1969 and 1972 SCCA National 'A' Production Championships, 1968 and 1970 SCCA National 'A' Production Runner-Up, 2nd Place in GT at the 1969 12 Hours of Sebring and the 1969 and 1970 GT class wins in the 24 Hours of Daytona. This car along with its team car won 22 of 22 SCCA/FIA National Events during 1969-1971, with this car winning 12 of the events. This car was awarded the American Heritage Award in 2007, the highest award for non-street Corvettes by the National Corvette Restorers Society. After restoration, it was first shown in 2002 at the Pebble Beach Concours for the 50th Anniversary of Corvette and more recently at the Amelia Island Concours in March, 2008. The car participated in a special display of Sebring race cars at The Quail Motorsports event in Monterey in August 2008. The car was the featured cover article in Vintage Motorsports, September 2008 issue. The OCF #12 shared the center stage with Grand Sport #2 at the Corvette Racing Tribute held at the Petersen Automotive Museum in L.A. in October 2008. The OCF car is the cover car in the definitive book on L-88s: Corvette Racing Legends by Peter Gimenez. The car was displayed at the National Corvette Museum in 2009 as the featured car at the Corvette Hall of Fame. Recently featured in "Winning Streak", Corvette News, March 2010. 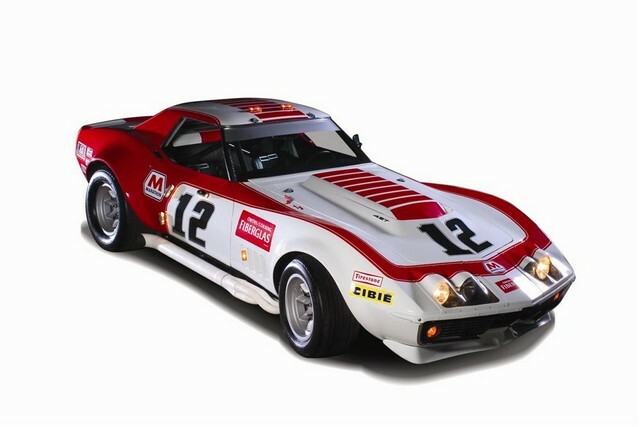 This car is shown in its 1971 24 Hours of Daytona livery and has been carefully restored to original specifications by Kevin Mackay at Corvette Repair, with generous assistance of Tony Delorenzo and Jerry Thompson, who were the primary drivers for the Owens/Corning team. This car has exhaustive documentation and clearly one of the most significant Corvette race cars in existence. This is a rare opportunity to own a one-of-a-kind high performance vehicle. 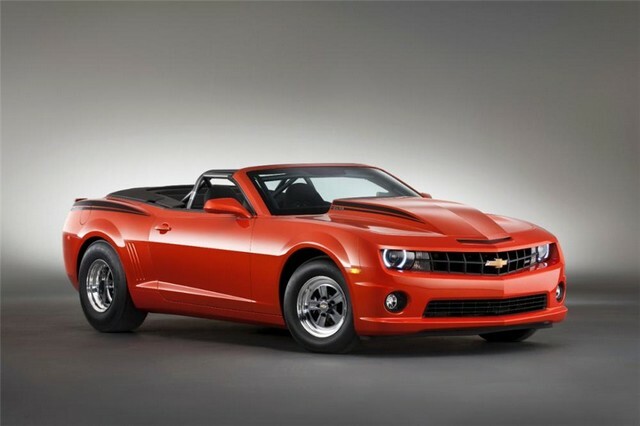 The 2012 COPO Camaro Convertible on auction is #69 of 69 2012 COPO Camaros produced. It is one of only two convertibles made, the other will be kept at the GM Heritage Center. And, this is the only one made in Inferno Orange Metallic. COPO is an acronym for General Motor's Central Office Production Order, a special order system that was used by dealers in the 1960s. A few performance-minded dealers manipulated the system to order vehicles with larger engines. Some were able to get 427cid big block engines installed in a handful of 1969 Camaros. The 2012 COPO Camaro was first shown as a concept at SEMA. The overwhelming response shaped GM's decision to produce a limited number for 2012, making it Chevrolet's first purpose-built drag-racing specialty car. It has a supercharged, LSX-based 327 (5.3 Liter) V8 featuring a 4.0 Liter supercharger, rated at 550hp, matched with a Powerglide three-speed automatic transmission. 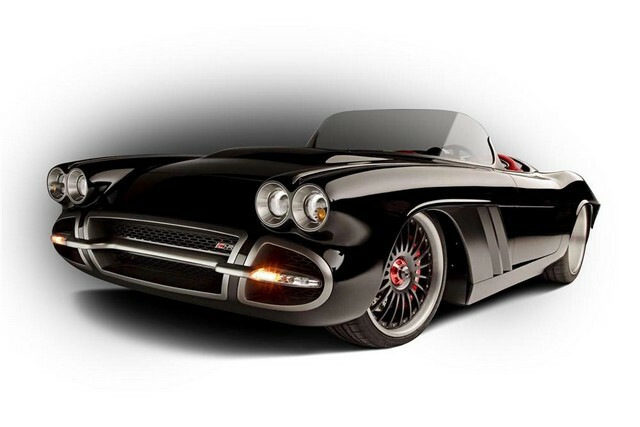 The engine for this model was hand built by GM's Jim Campbell at the Performance Build Center in Wixom, Michigan. The inside of this COPO Camaro is also Inferno Orange. There is room for one lucky passenger, with two racing bucket seats. The driver can strap in with a safety harness and grab onto the competition floor shifter for the exhilarating ride. One hundred percent of the winning bid will benefit the American Heart Association, whose mission is to build healthier lives, free of cardiovascular diseases and stroke. Winner of the Goodguys Street Machine of the Year and SEMA GM Design Award for Best Hot Rod in 2009, this 1962 Chevrolet Corvette known as C1RS represents a custom build for Barry Blomquist by The Roadster Shop in Mundilein, IL, raising the custom automobile bar to seemingly new heights. C1RS begins with a Roadster Shop custom chassis using Detroit Speed and Afco suspension components, one-off Forgeline 3-piece center lock wheels and giant 141/2" 6 piston Brembo brakes. Every panel of the car received custom treatment, from the one-off carbon fiber body accents to the European-inspired leather interior with custom aluminum dash, console and trim. A Kinsler Cross-Ram injected 427cid/618hp LS7 engine, Tremec T56 Bowler 6-speed and Ford 9 inch posi-traction third member complete the powertrain. Designed by The Roadster Shop and artist Eric Brockemeyer, C1RS is a striking blend of hand formed aluminum, one-off carbon fiber accents, and impeccable curb appeal. Every body panel of this masterpiece has received monumental modifications. All trim pieces including girlles, dash, console, and faux roll bar are hand formed from aluminum. the interior is one of function, raised to an art form. Adding a splash of color is the red leather Alcantera suede covered custom made seats and door panels. Even with its inspired design and meticulous craftsmanship this car performs as good as it looks. It has competed in many autocrosses and the Optima Street Car Challenge where it received the style and design award. This amazing piece of automotive art has been featured on national television shows and in many print and online publications including Hot Rod magazine, Super Chevy, Muscle Car Power, Goodguys Gazette, adn teh Robb Report. Check it out on Youtube. From the Barry Blomquist Collection. 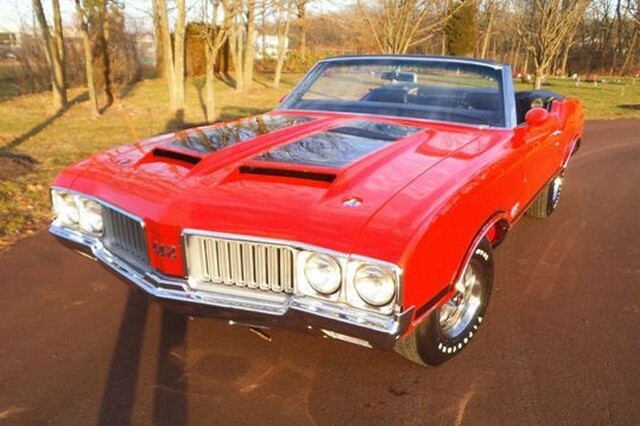 1970 442 W30 4-speed convertible with its original born-with drivetrain. Outside air inducted 455 with original carburetor, distributor, aluminum intake manifold and F heads. Muncie 4-speed with original Hurst shifter. Aluminum W-27 3.91 posi-traction rear that was W30 special order only. Original Window Sticker, Broadcast Card, dealer invoice and warranty card. Complete photo history start to finish. Three owner car. Features manual steering, tinted power windows, Rally Pak gauges, deluxe steering wheel, buckets and console, AM radio and SSII wheels. 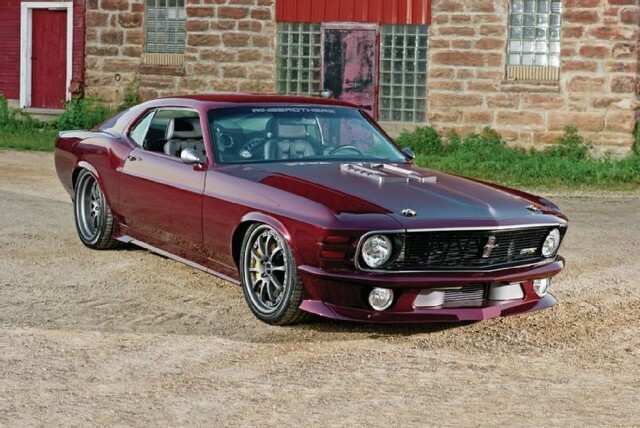 Restoration by Jeff Thornton of Telford, PA.
Award winning 1970 Ford Mustang Mach 1 "Dragon" created by the Ringbrothers has captivated enthusiasts worldwide. Mike and Jim Ring, famous for their cutting edge design and unparalleled attention to detail, have once again raised the bar for custom automotive builders. Dragon's powertrain includes a ROUSH 427 IR motor that cranks out 585hp and 545ft/lbs of torque. The engine is lubricated by an external oiler system with custom oil cooler. Dragon has a smooth TKO 5-speed transmission along with a functional custom billet dual Shaker system. The rear suspension is Detroit Speed quadralink and the front is a JME double wishbone. The massive Baer Pro Plus brakes include a brake line lock. The wheels are custom Forgeline. The Ford GT inspired interior is a flawless design of custom leather wrapped interior, billet accents, Recaro seats, racing harnesses, custom Classic Instruments gauges, Alpine flat screen audio and Vintage Air. The paint is a custom BASF "Dragon's Blood Red" with "Castle Gray" accents. The entire front and rear end of "Dragon" are built from carbon fiber and machined billet. The unibody design was replaced with a custom full length frame that includes belly pans running the entire length of the chassis. The doors and roof have been redesigned to make it look like it is in motion while it is standing still. Dragon's awards include the prestigious 2010 SEMA Mothers Shine Award, 2011 Hot Rod & Restoration Golden Builder Award, 2011 Goodguys Street Machine of the Year Finalist, 2011 Car Craft Pro Builders of the Year and Mustang & Ford named it 2011 Car of the Year runner up. This amazing car has been featured in many print and online publications including Popular Hot Rodding, Modified Mustangs and Fords, and Mustang Monthly. 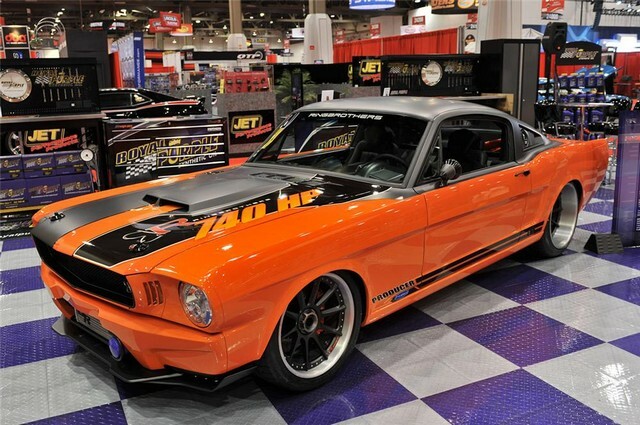 A 1965 Ford Mustang nicknamed "Producer" and built by the Ringbrothers that claimed the title of the 2012 Goodguys Optima Batteries Street Machine of the Year award. The car, which debuted at SEMA last year, drove off with the top award at the Goodguys 15th PPG Nationals in Columbus, Ohio. Well known for their ability to transform Mustang's into modern masterpieces, the Ringbrothers have set the bar even higher with this '65 Mustang. The body was widened an incredible 4", highlighted by the custom BASF orange paint, and both the hood and roof are carbon fiber signature Ringbrothers touches. Under the hood is a high compression Keith Craft-built 427cid stroker based on the 351 Windsor small block making 740 crank horsepower. Of the 216 L-88 Corvettes that Chevrolet produced in 1967, 1968 and 1969 this is number 216. The last documented L-88 Corvette that General Motors ever produced. 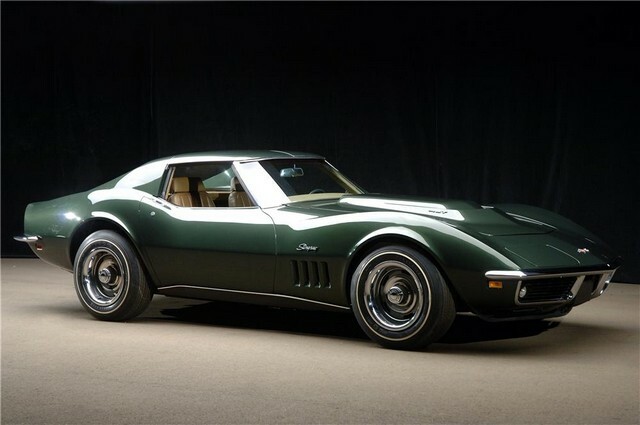 This number correct and component correct Corvette was built in the final days of the 1969 model year's production on Thursday, December 4, 1969. This car has had 2 restorations. The last one was a body-off restoration completed by Thorpe's Corvettes, Tim Thopre is a past Bloomington L-88 judge. The original owner was the Smiley family, who also owned Smiley Chevrolet-Olds Milan, Missouri. The original Corvette order copy Build Sheet is there as is a copy of the Window Sticker. This 983 Fathom Green, 421 Saddler leather trim Corvette coupe has the following documented options L-88 special purpose 427/430hp engine, transistor ignition system, A01 soft ray tinted glass, F41 special purpose suspension, G81 posi-traction axle 3.70 ratio rear, J50 power brakes, J56 special brake system and M22 Rock Crusher 4-speed transmission. If you could own any of the 216 L-88 Corvettes, what better than the last one, a piece of history that won't repeat itself.